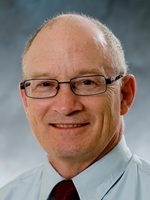 A kinesiology generalist, Dr. Bartlett teaches the social-cultural courses, some of the scientific foundation courses, and Coaching of Wrestling. He has presented and published research on sport facility design. His current research interest is in the area of cross-cultural sport studies. Formerly Northwestern's wrestling and women's golf coach, he served as president of the NAIA coaches associations for both sports and was inducted into the NAIA Hall of Fame.